Goodness, I am behind :). Challenges, comments, email.. must be a sign of a great holiday season. This post is for The Friday Mashup #38. I tried to Mash it up, but my watercolour image kept getting in the way, so I cut the side band to fit on either side of the image frame rather then run across it. I coloured the image with my Tombo markers then spritzed it to get it more of a water colour look. I added a simple Hi for the sentiment. 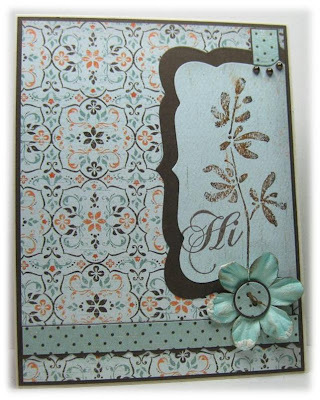 Supplies: Natural Ivory and brown cardstock, Designer Paper-Authentique, Stampin' Up-Watercolor Trio, TPC-Cardmaking Hello, Spellbinders, Prima flowers, Recollections pearls. I will try to get caught up in comments, emails and such over the next couple of days. Thank you to everyone who has stopped by and left a comment. I have a Mojo Monday #221 card to show for the current challenge then I will share a few photos from my recent adventures up at Mt Washington. 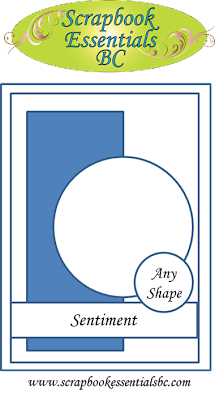 I went with a square card for this challenge, I have made a few of these smaller cards over the last little while and like them. 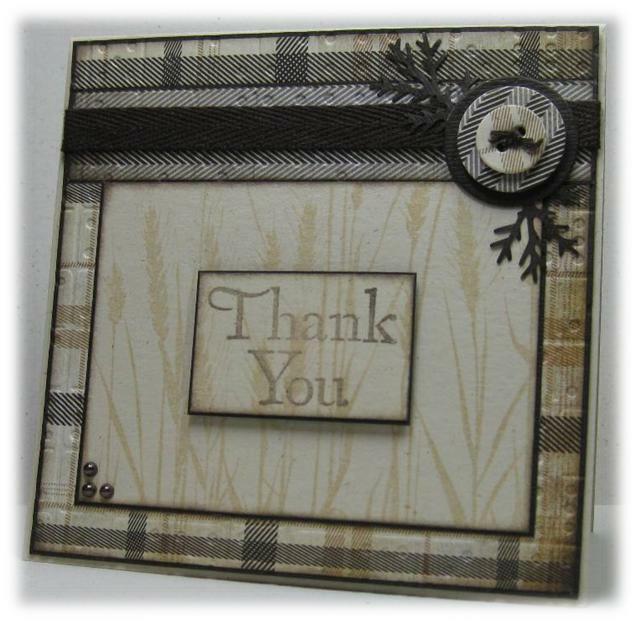 ﻿Supplies: Natural Ivory and brown cardstock, Designer Paper-Basic Grey, Hero Arts-Silhouette Grass, TPC-Card Making Thank you, misc punches, ribbons, Recollections Pearls. 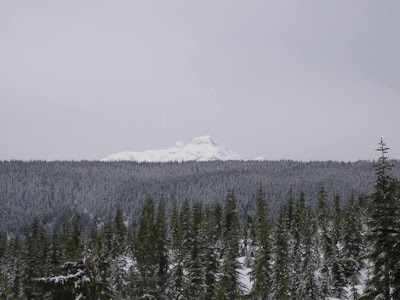 My husband and I try to get up to Mt Washington at least once a winter for a little snowshoeing. We rent a condo down in Comox for an evening and treat the trip like a mini vacation. 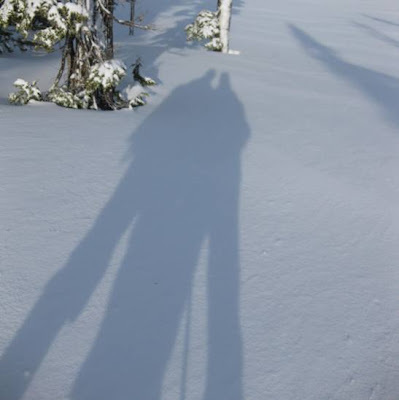 We had two wonderful days of snowshoeing. The first day it was overcast and the snow was icy from a recent rain however the weather was nice and we were lucky to feed the Whiskey Jacks. 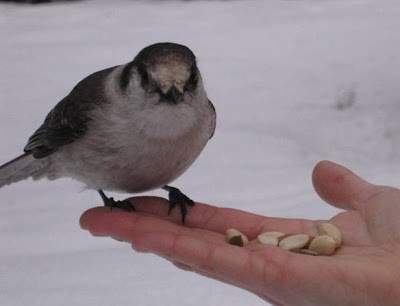 It is usually touch and go whether we see these little guys but we always carry trail mix with us just for them. They love the large raw cashews, almonds and peanuts but they seems to always grab the large plump raisins first and tend to toss away the pumpkin and sunflower seeds. This little guy appears to be glaring at me for the poor selection offered. The second day was beautiful and sunny but windy, there was a nice amount of fresh snow overnight. We were there early enough to break trail the whole time and we spend most of out time off trail and in the back country. I hope everyone is having a wonderful holiday season, it is hard to believe that Christmas has come and gone. There is so much build up then it is just... over. 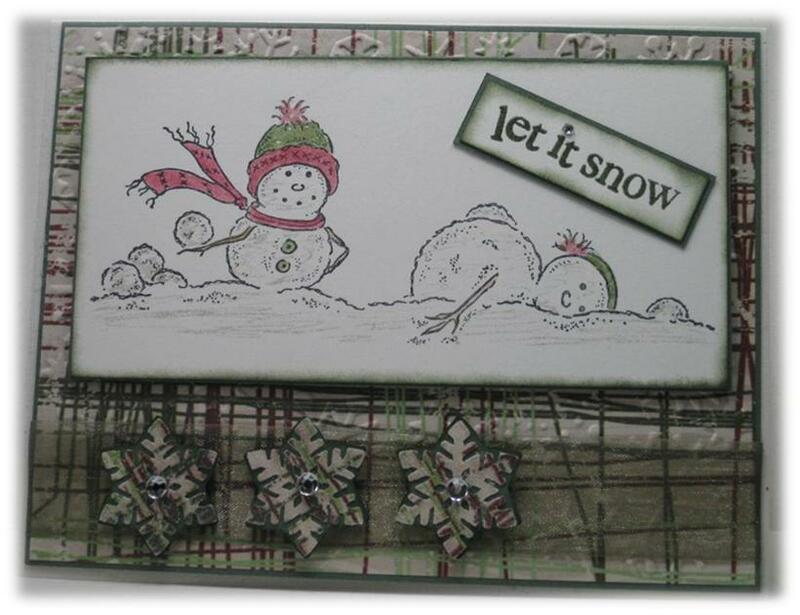 I still have a few days off though and I have grand plans to get a few cards made. I was able to spend a little time with my craft supplies last night so I tackled a couple of challenges. This post is for the current Playing in Paradise challenge. 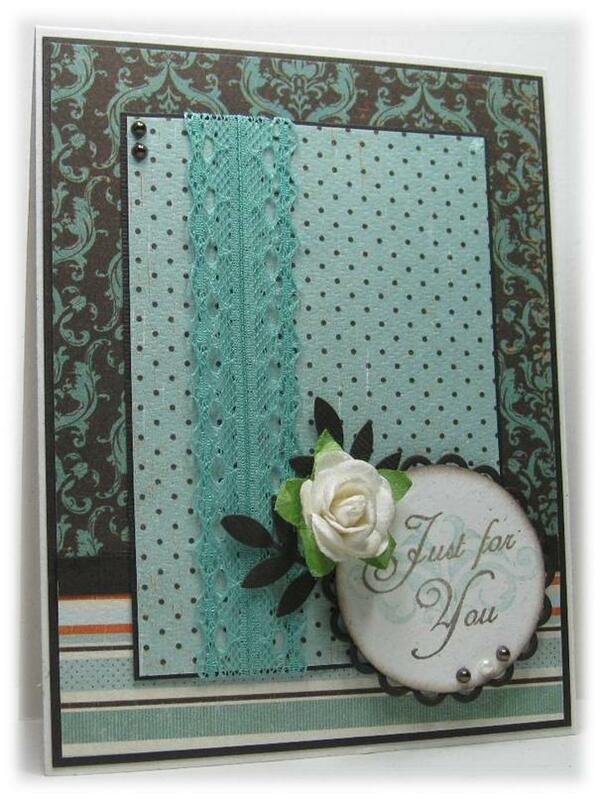 Supplies: Natural Ivory and turquoise cardstock, Designer Paper-Cosmo Cricket, TPC-Card Crafting Thank you, Sizzix embossing folder, Cuttlebug die cut, Kaisercraft pearls, misc twine. Happy Tuesday, I am so happy the first day of the work week is done. The rest of the week, and the last stretch to Christmas is in full swing. 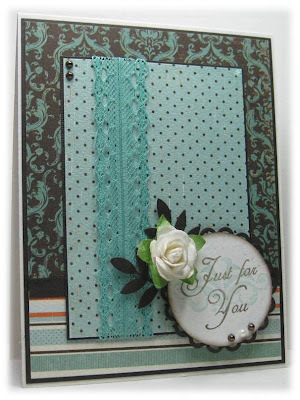 Today’s post is for the Scrapbook Essentials BC Challenge #3. 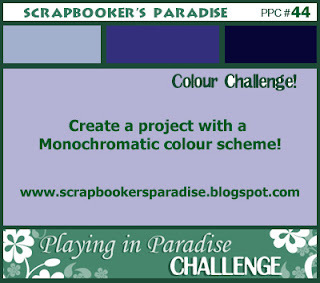 This week's challenge is all about colour. Weaving all this paper took me forever :), I was not sure I was going to like it at first but once it was all put together and with all the added elements I was happy. 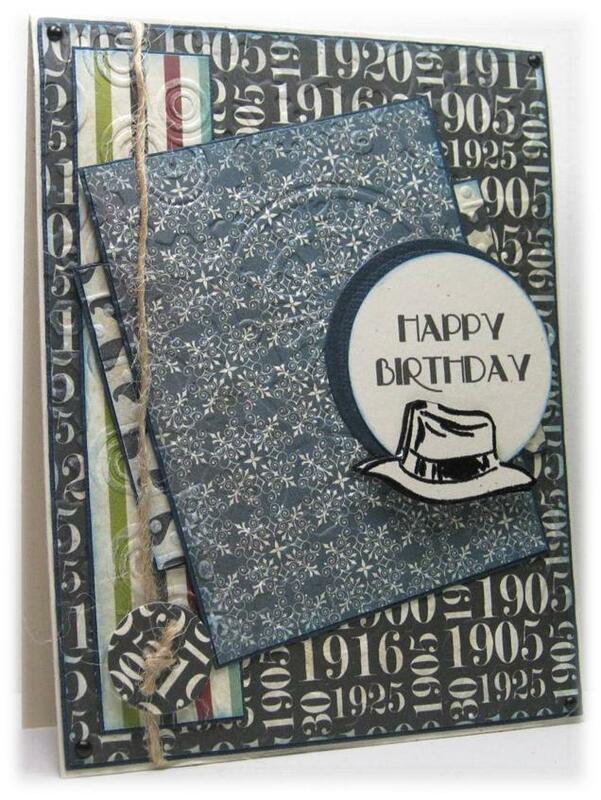 I heat embossed the image with clear embossing powder then inked over top with gray and pink. You can find these beautiful stamps at the Scrapbook Essential BC online store. Take a look at the wonderful samples that the other design team members have created. 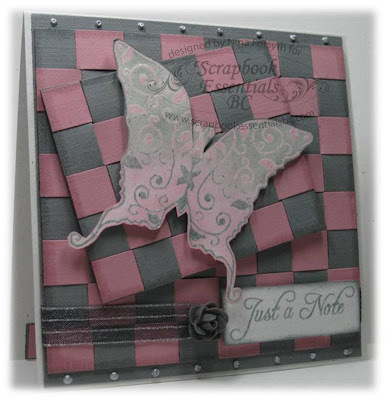 Supplies: Natural white, gray and pink cardstock, Scrapbook Essentials BC-Whimsical Butterflies 1, Inspired by Stamping-All Year Wishes, Recollections-Floral Embellishments, Stickles, misc ribbon. Good Evening all, a short post for today new Mojo Monday Challenge. 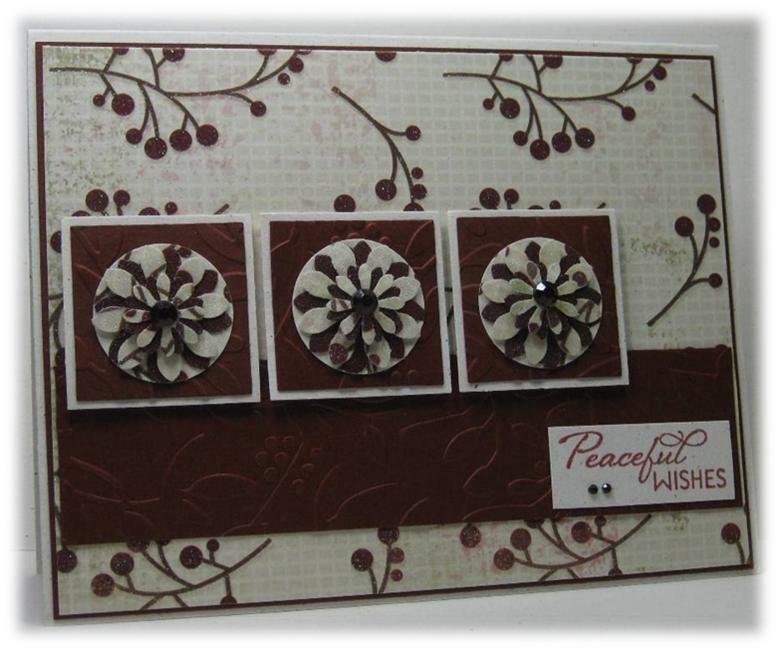 Good Evening All - I had to wait till my hubby headed off to work before I could get creative with this card. This is the very last Christmas card I needed to make and I hope he does not check my blog and see his card :). 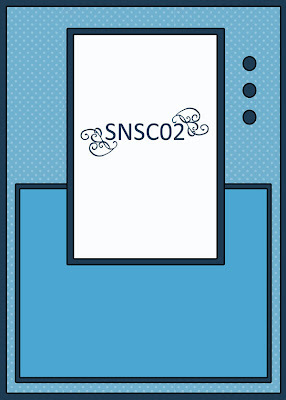 I used this week's The Friday Mashup challenge for this creation, unfortunately I did not manage a mashup. This card is a little larger at 5.5 x 5.5﻿. I used chipboard on the base of the multi-layered snowflake. I found this wonderful glitter paper in a local craft store this weekend and I had an instant idea for this card, the silver and black paper reminds me of my husbands motorcycle that is all black with lots of chrome. Supplies: Natural white and black cardstock, Glitter paper-Best Creations, Verve-Christmas in the Air, spellbinders die cuts, Celebrate It ribbon, misc sugar coated brad, Crystal Stickers - Glitter Dome. Happy Friday - the last weekend before Christmas. 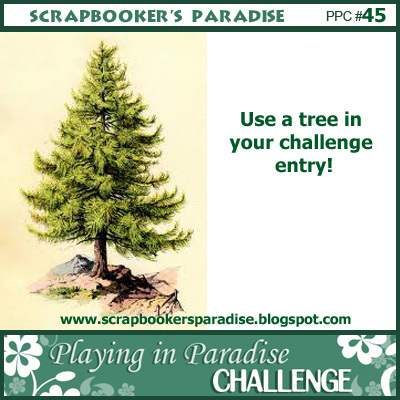 I am starting to get a little excited, with that said I did not make Christmas card for this weeks Playing in Paradise Challenge # 46 :). I am even more excited and honoured to be a asked to be a part of this fabulous Design Team in the new year, how fantastic is that. This week challenge is all about Buttons!!! How easy is that? 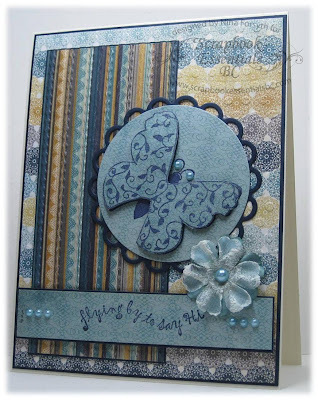 Create a card, scrap page or a project using buttons. Anyone who follows my blog on even a semi regular basis knows I LOVE buttons, more specifically making then with paper and heat embossing them.﻿ This card is no different. I received my new Dec stamp set from The Stamps of Life this week and could not wait to ink them up. The candies are three layers deep with the last layer I made into buttons and popped up with foam tape. My husband thinks my card is psychedelic with all the swirls but I like it. 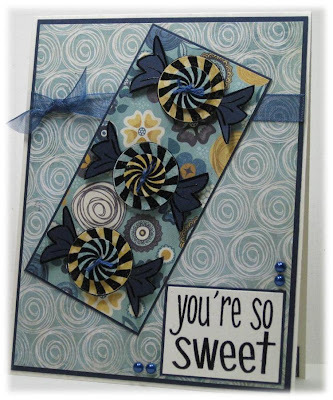 Supplies: Cream and navy cardstock, Design Paper﻿-Stella and Rose, The Stamps of Life-candy2share, misc ribbon, kaisercraft pearls. 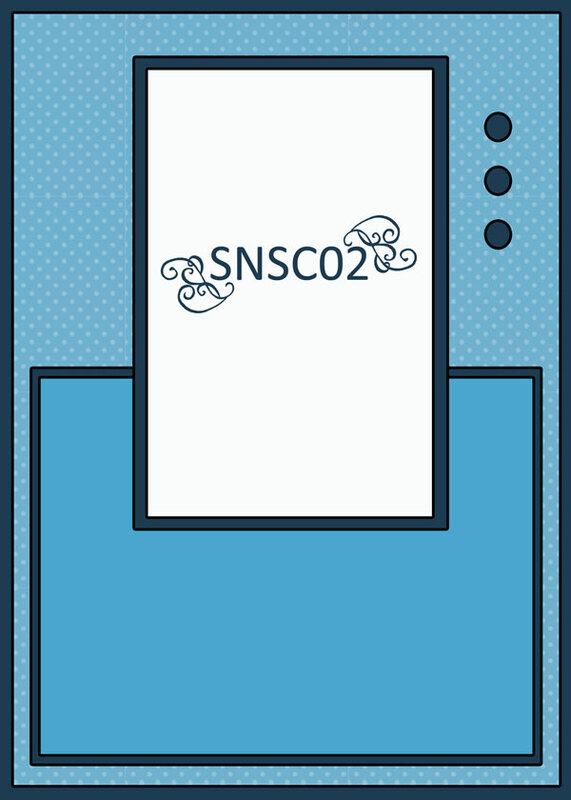 A quick early morning post for the new Freshly Made Sketches challenge #15. With all my embossing I am also playing along for the current Scrapbook Essentials BC Challenge. Supplies: Cream and brown cardstock, Designer Paper-My Mind's Eye, Hampton Art stamp, ﻿Inkadinkado-Thank you words, misc embossing folders, misc ribbon, Stickles. Good Morning campers, I can't believe that it is Wednesday already- I love it. Christmas is coming ya know. This post is for the current Mojo Monday Challenge #219. I think I made this card way more labour intensive than it needed to be and I am not sure I like it yet. The idea in my head just did not translate as expected. Ahh it happens. 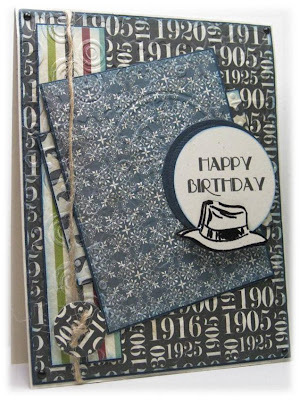 Supplies: Natural Ivory and navy cardstock, Designer Paper - Echo Park, Stamp it - Panama Hat, misc twine, Recollections-mini brads, button die cut, misc punches. I can't believe how quickly time is flying, where did the first two weeks of December run off too? It is a good thing I am 99% prepared for the holidays and can enjoy the little treasures that come along. 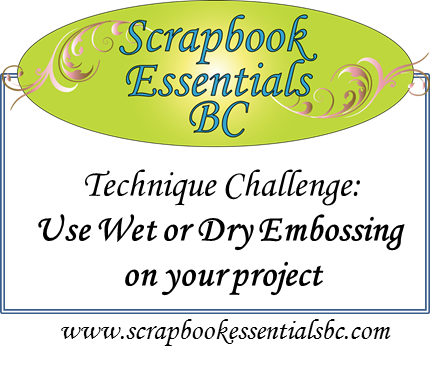 The treasure for today is a fresh new challenge for Scrapbook Essentials BC. 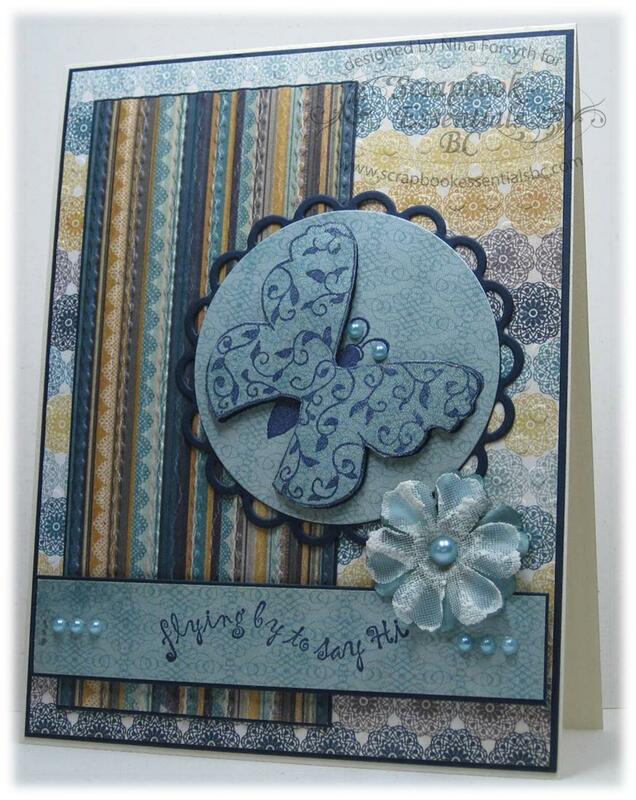 I also embossed the cute little chipboard butterfly as an embellishment and added some pearls for the body. 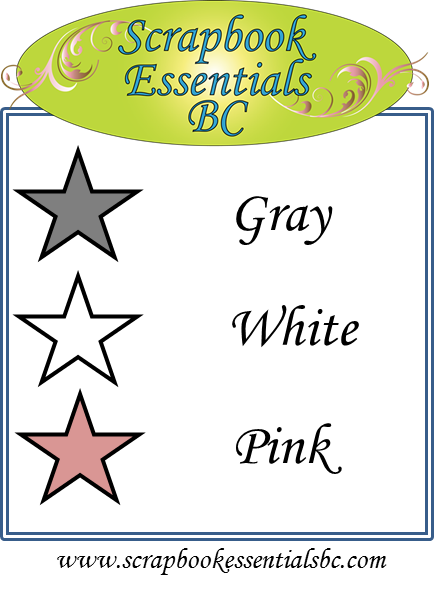 You can find these beautiful stamps at the Scrapbook Essential BC online store. 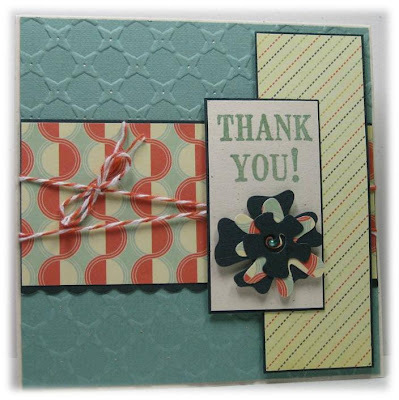 Take a look at the wonderful samples from the other design team members have created. Supplies: Cream and brown cardstock, Designer Paper-Hot off the Press, Essential Stamps- Whimsical Butterflies 1, Inkadinkado - Thank you words, chipboard butterfly, Cinnamon Toast embossing powder, misc ribbon, Kaisercraft pearls. I used a Clear Star jelly roller to add a bit of sparkle to the snow. I added a little Diamond Glaze to the hats. Supplies: Natural White and green cardstock, Designer Paper-Scribble Scrabble, Impressions Obsession-Snowball Fight, Hot of the Press- Mix your message, Cricut-Snowflakes, misc gems and ribbon. Playing in Paradise Challenge # 45 is "Create a card, scrapbook page or any project using a tree as your main focus." Lots of layers, foam tape and... green :) not much else to say.. oh and a tree. Supplies: Kraft and green cardstock, Designer Paper-Basic Grey, Paperbagstudios - Lone Tree, Hot off the Press-Tiny Words, Cuttlebug embossing folders, misc pearl, twine and punches. 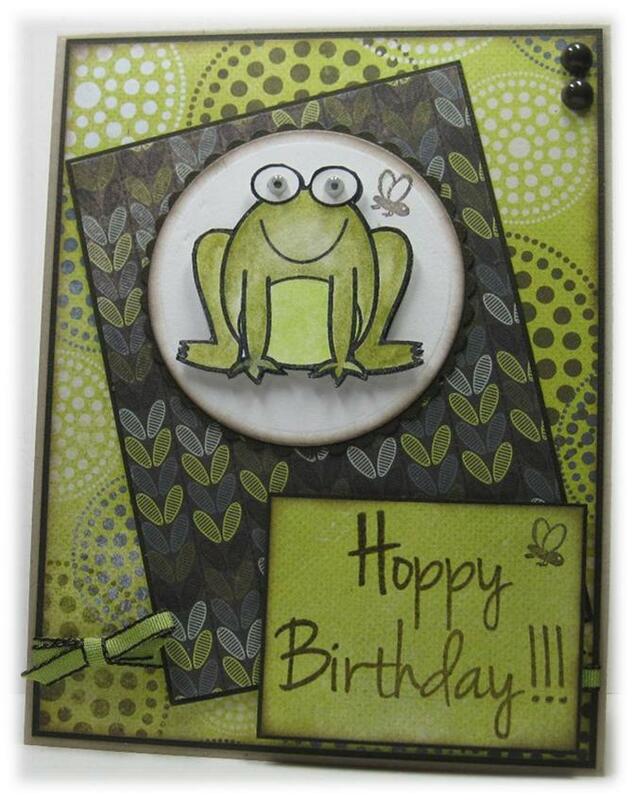 I love frogs, I think I came by my love of them from my oldest brother. I remember random little frog knickknack's that he had, this through the eyes of a child so who know it may have only been one or two. I am pretty fussy about my frogs though, but I like this one. I used googly eyes but I think it makes it look like froggy is wearing glasses? Am I alone.. google eyes or glasses, the debate is on. I dare you to comment with your thoughts :). I created lots of layers-even froggy has a second layer popped up with foam tape, I colored the images with my water colour pencils then used a blender pen to smooth out the colour. 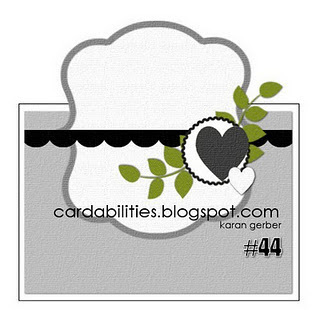 Supplies: Kraft and brown cardstock, Designer Paper-Basic Grey, froggy2love - The Stamps of Life, Spellbinders die cuts, Chocolate brown - candy dots, misc ribbon, googly eyes. Good Morning all- a quick post for the current Freshly Made Sketches challenge. I thought I would change it up a little and make something other than a Christmas card. 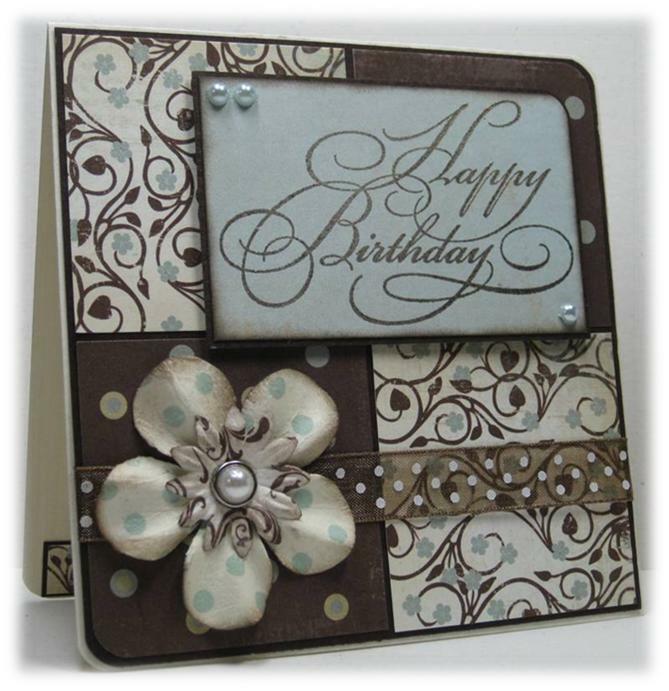 Supplies: Cream and brown cardstock, Designer Paper- My Mind's Eye, Close to My Heart- Gracious Greetings, Prima flowers, misc pearls and ribbon. We started wrapping the gifts that we need to ship off last night, there is no hiding it I guess.. Christmas is coming. I think I am almost done making Christmas cards to, I am proud to say that all the cards I made this year are all unique. I can't seem to get away from this designer paper, each double-sided sheets draws me in. Originally I was using my Verve die cut to get a musical print tree however when I turned it over the glitter was placed perfectly so I left it as it. The top two layers are popped up with pop dots. Supplies: Cream cardstock, brown sparkle paper, Designer Paper-My Mind's Eye, Verve-Bright Spirits and Die cuts, misc embossing folders, Stampin' Up! 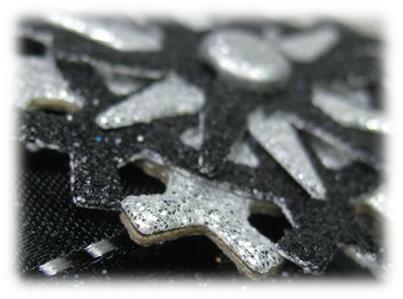 ribbon, Crystal Elements-glitter domes. December 6th is finally here and today over at Scrapbook Essentials BC Challenges the very first sketch challenge is being unveiled. I am excited and honoured to be part of the Design Team. Be sure to post your project to the linky by Sunday, December 11th at Noon (PST). Take a look at the wonderful samples from the other design team members. ﻿Good Evening, just a quick post for this week's Mojo Monday #218. I was not sure my creativity would return today, yesterday it was a disaster. I put some Christmas tunes on for a little while though and I made it through. I had a small stack of Christmas DP out and ready to flip through but in the end I was drawn back to the My Mind's Eye Lost & Found Christmas. 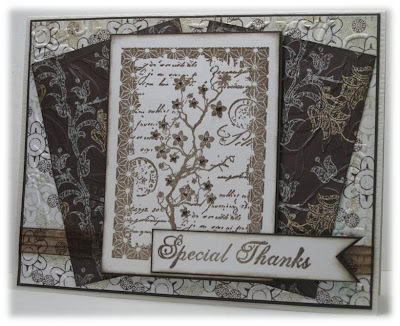 Supplies: Natural Ivory and brown cardstock, Designer Paper-My Mind's Eye, Verve-Glad Tidings, Cuttlebug folders, Memory Box die cut, misc punch, misc ribbon and glittter dots. It is a gorgeous Saturday here today. The sun is shining and the frost was so thick this morning that it almost looked like snow. Definitely puts me in the mood for making Christmas cards. 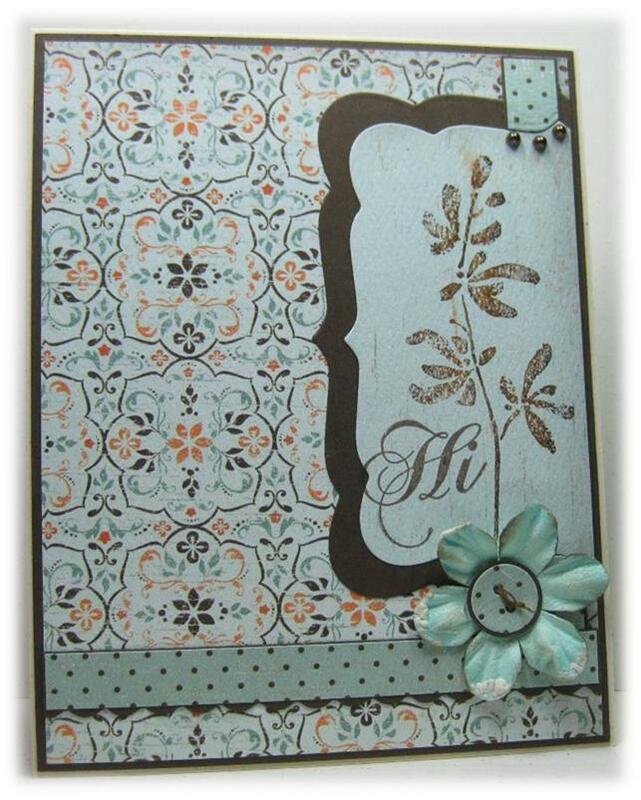 Cardabilites has a new sketch ready for us to follow along, I am pretty excited my card from last challenge was identified as a Featured card. I was rather lazy this morning when I started this card, this DP was sitting on the corner of the desk so I naturally migrated towards it. The sentiment is heat embossed with beautiful Moss Tinsel embossing powder. 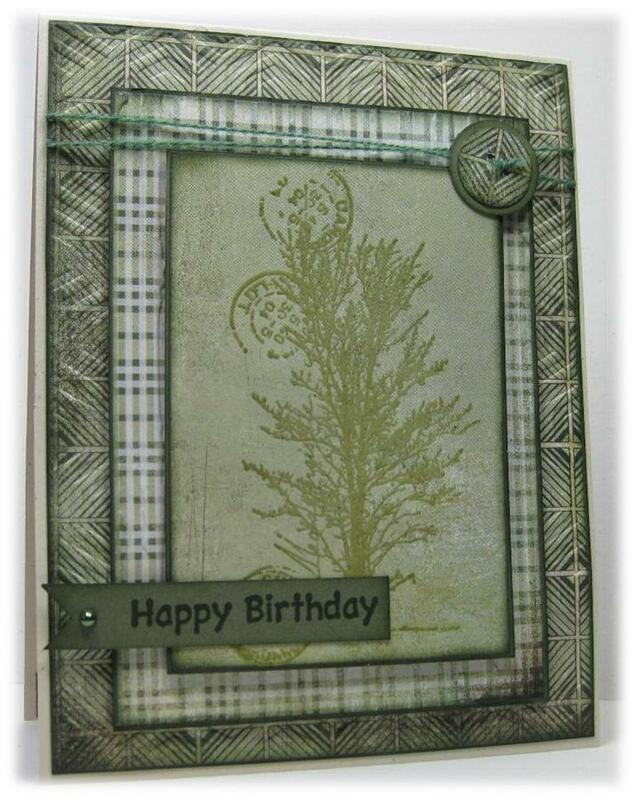 I also dipped the branch pieces in Antiquites embossing powder as well. I finished with lots of rhinestones. 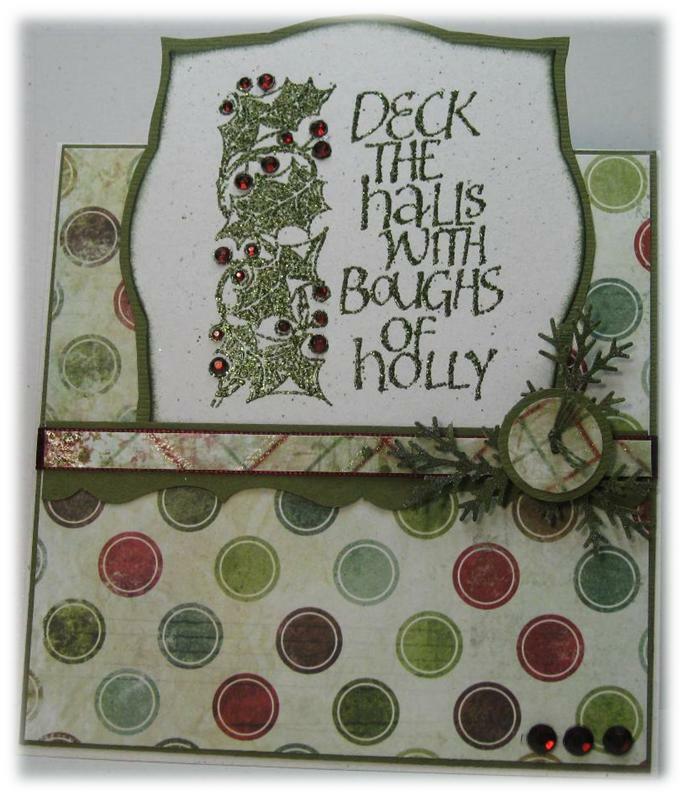 Supplies: Natural white and green cardstock, Designer Paper-Recollections, Magenta-Deck the Halls. 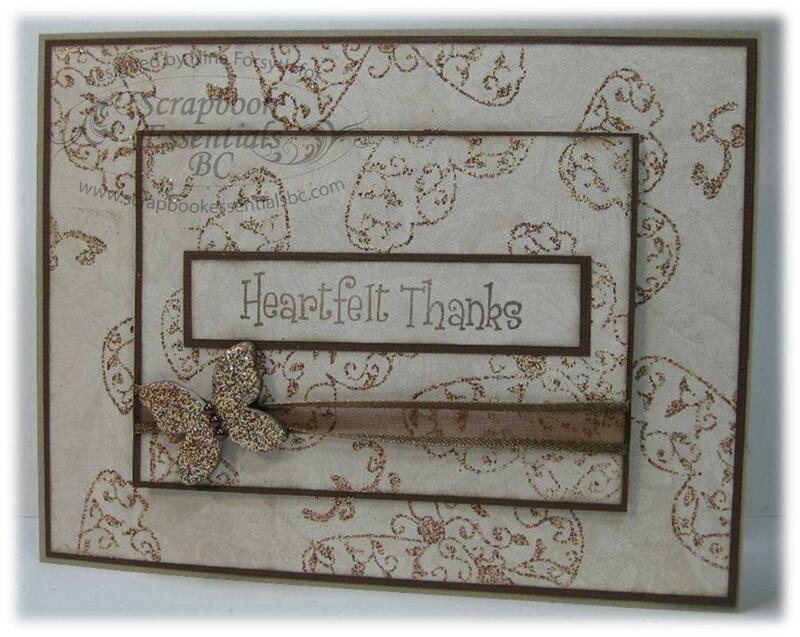 Spellbinders die cut, misc punches, misc ribbon, Recollections Rhinestones. Hello again, I am back for a second post. 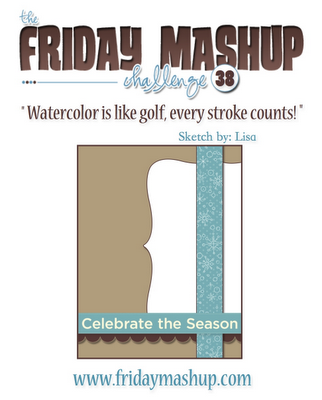 This time for The Friday Mashup challenge for this week. 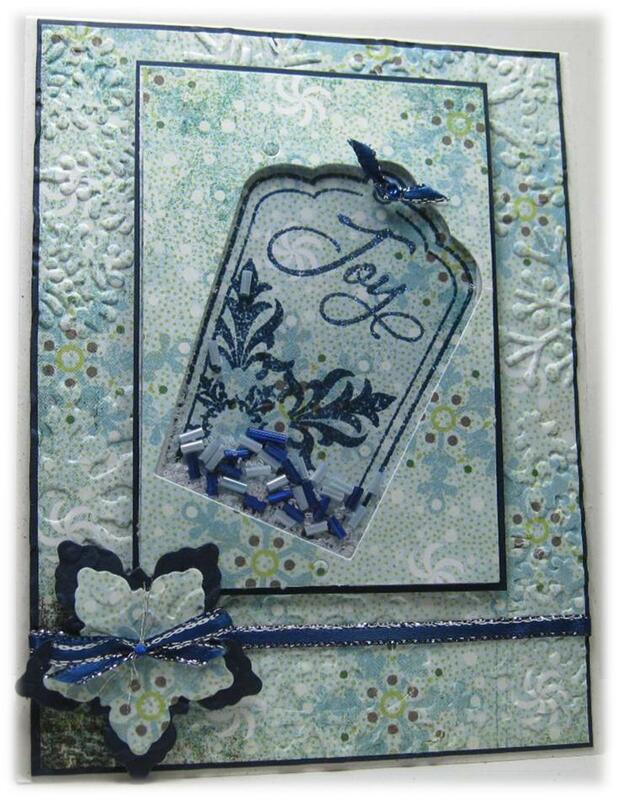 I have only ever made a shaker card once before, it was in a card class I took years ago. It was a disaster, I had made up my mind to just not bother...*sigh* ahh Mashup, I just could not resist. It took some futzing around but I made it work, I might even try again :). For my window, I cut up the plastic packaging from an embossing folder I brought this week. My shaker contents are beads and large chunk glitter. 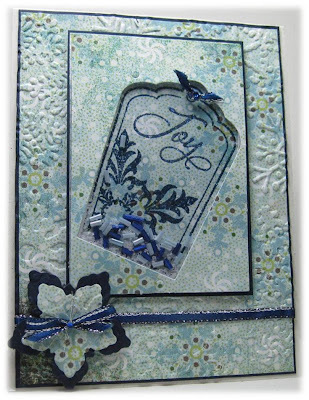 I heat embossed the background image with navy embossing powder, then embossed Joy with Midnight stars sparkly embossing powder to give it some glitz. 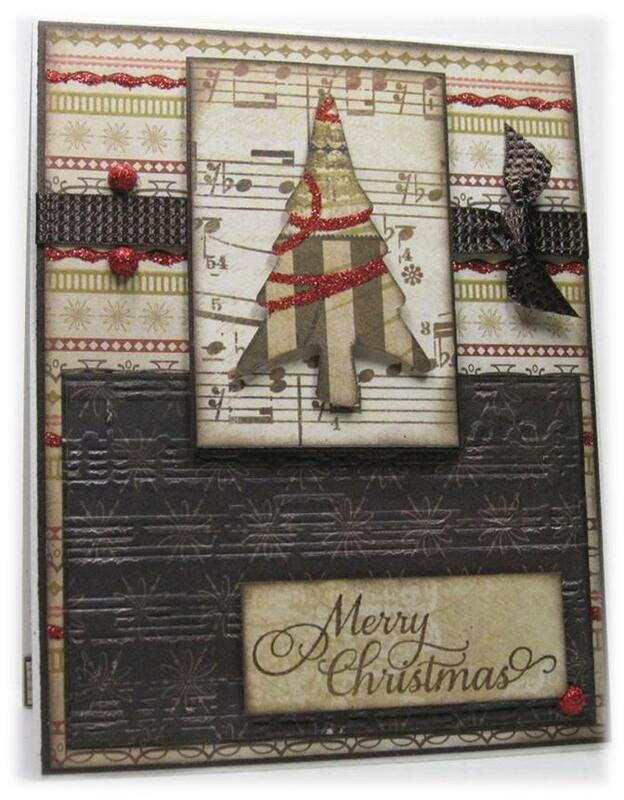 Supplies: Natural white and navy cardstock, Designer paper- Basic Grey, Verse-Glad Tidings, Verve-Die cuts, Sizzix embossing folder, misc ribbon and Recollections Gems. 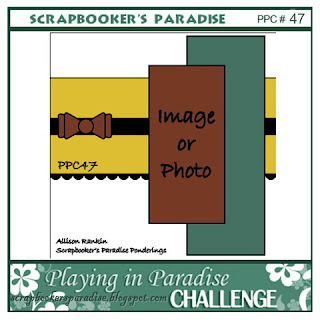 Happy Friday Everyone - I have exciting news, I have been asked to be Guest Designer over at Scrapbooker's Paradise for this week's Playing in Paradise challenge. I am thrilled, thank you so much ladies. 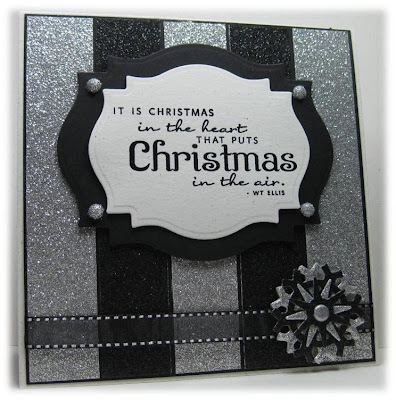 This weeks challenge is perfect for me as I have been fascinated by monochrome cards for the past little while, more specifically black and white. 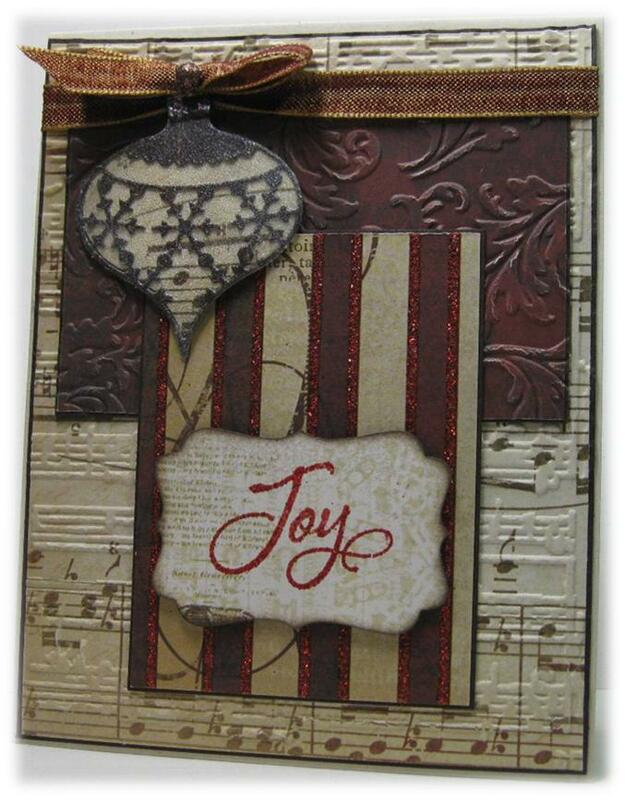 I found this wonderful free kit over at ShabbyPrincess﻿ that had this digital designer paper. I don't usually have much luck with hybrid cards but this turn out great. 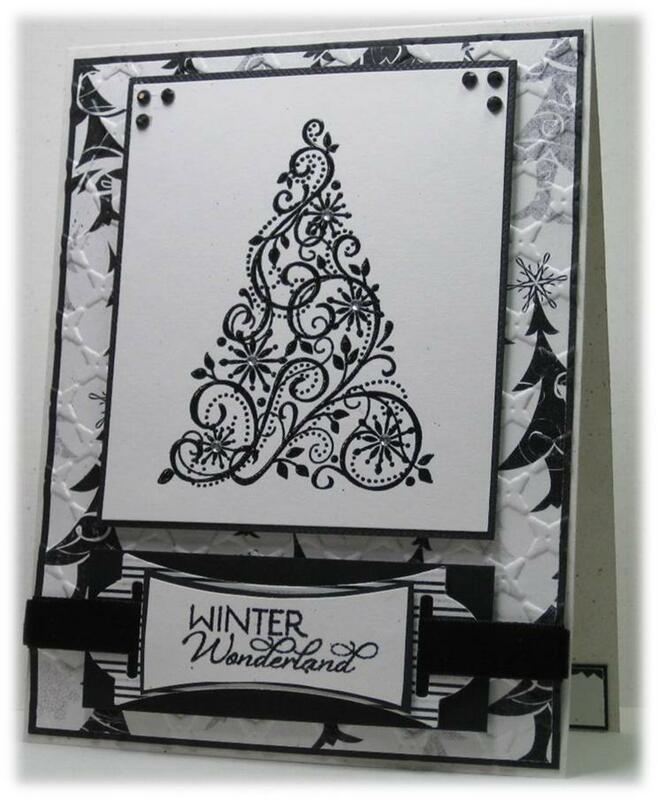 I heat embossed the tree and sentiment with black embossing powder then added clear rhinestones. Just about every layer is popped up, and the sentiment is 4 layers thick not including the velvet ribbon running long the back. I finished with the black rhinestones in the upper corners. Supplies: Natural White and black cardstock, Designer Paper- ShabbyPrincess, Stampin' Up!-Snow Swirled, Verve-Glad Tidings, Spellbinders dies, misc embossing folders, Kaisercraft rhinestones, misc velvet ribbon. Wowzers this week has zoomed on by, I don't even have any wild tales to say I enjoyed the speedy passage of time. 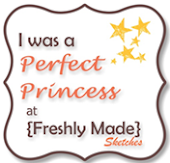 I am pretty excited though that my card from last weeks Freshly Made Sketches earned me a title of Perfect Princess, how fantastic is that :) big smiles... thank you so much ladies. I will post my little badge with honour. If you have not seen the amazing cards created by some very talented card makers so hop on over to the blog to take a peek. With that all said it is time for the new challenge over at Freshly Made Sketches. Lesley has created a wonderful sketch for us to try. As I was out shopping for a dress shirt with my son yesterday at Winners, I thought I would take a look in the kitchen section (my husband started my oven mitts on fire the other day) needing some replacement mitts. We have to go through the stationary isle to get there, and there was an amazing section of designer paper stacks who would have thunk it... Winners of all places. Anyhoo, found this wonderful My Mind's Eye - O Christmas Tree Glitter cardstock stack, not that I need any more but it is so pretty and sparkly. 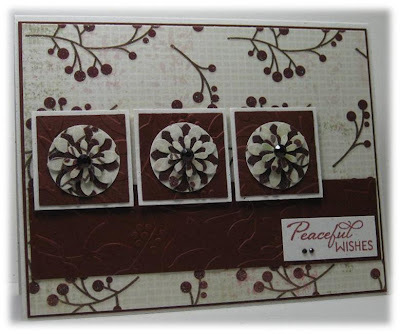 Sheesh boring you now, so pretty little faux poinsettia's are created from misc flower punches then heat embossed with the Antiquities embosssing powder, layered with foam tape and topped with a gem. Supplies: Cream and burgundy cardstock, Designer Paper - My Mind's Eye﻿, Verve-Glad Tidings, misc punches and embossing folders, Recollections rhinestones.